Al Herr founded the Village Idiots in Raleigh, NC in 1995. The Idiots went through several cast changes before the group finally coalesced and began doing regular performances in 1997 at the Art in Motion dance studio. 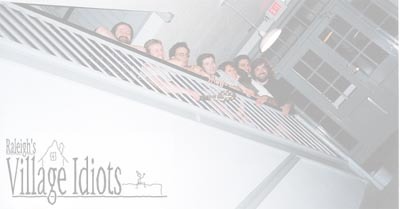 In early 1998, the troupe decided to concentrate on the local market and changed the group’s name to Raleigh’s Village Idiots. This group performed together for many months. During this time, many of the traditions that set the Idiots apart were established. They used few props or costumes, the show format was heavily scene-oriented (trying to avoid the easy gags and gimmick-heavy format of many other short form improv groups), and had musical accompaniment throughout the show. The Idiots also established themselves as risk takers; exploring the boundaries of their art; always refining the types of scenes that they performed; adding new forms to their repertoire – sometimes in the middle of show! Starting in 1998, the Idiots also began to offer free workshops to the public with students from all over Central Carolina. In these workshops, anyone could learn the basics of Improv and have a great time doing it. Those that chose to do so for more than a few weeks joined the ranks of the Half-Wits (who else would study under Idiots?). Advanced students from the workshop were asked to perform in some of the shows. These workshops continued until the middle of 2002. Afraid of Y2K, the Art in Motion theater closed in 1999 and the Idiots were forced to temporarily relocate to Cary, NC. 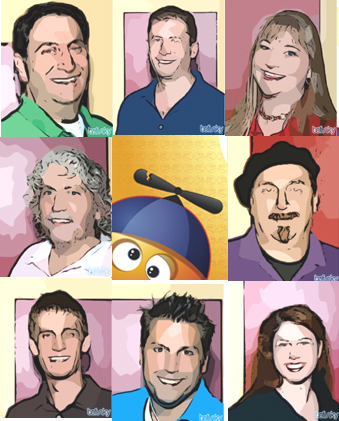 The Idiots returned to Raleigh to perform at Raleigh Little Theatre’s Comedy Under the Stars. Shortly thereafter, the Idiots began to perform regularly at RLT. In October of 1999, Raleigh’s Village Idiots participated in the national improv project against violence Don’t Hate Us Because We’re Funny: The Improv Community’s Benefit Against Violence and Hate Crimes, and performed regular shows throughout 2000 at the Clara Barton Hall. To celebrate the new millennium, the troupe split in 2001. Half the troupe explored more gimmick-based comedy by forming a troupe called The Product and the rest of the Idiots explored more artistic and scene-based directions. Unfortunately, or fortunately as it turned out, two halves didn’t make it alone. Many of the troupe members reunited in March, 2002 with the formation of Mid-life Crisis at the North Raleigh Arts and Creative Theatre. It didn’t take long before we realized Mid-life Crisis wasn’t our true identity and we resumed the mantle of Raleigh’s Village Idiots combining the games and scenes we had perfected separately. Raleigh's Village Idiots performed their final show at the North Raleigh Arts and Creative Theatre in November, 2014. Currently Raleigh's Village Idiots perform public, private, and corporate shows at various venues around the Triangle.